Happy New Year! I hope everyone is enjoying a last evening off before returning to work. I needed another week, I think. This weekend, I’ve been curled up with Elizabeth Kostova’s novel The Historian. I think I have about 140 pages left in that one, but it’s over 700 pages, so I’m actually in the home stretch. I will save my comments for the review. I have also been dipping into Antonia Fraser’s biography of Marie Antoinette, but I haven’t made much progress with Simon Schama’s Citizens. I listened to the first chapter of the final book in the All Souls trilogy by Deborah Harkness: The Book of Life. I am mainly curious to find out how the series ends. I did not get a chance to show you what I got for Christmas. I started playing guitar in high school and even took a classical guitar class in college, but I admit I haven’t played much in years. 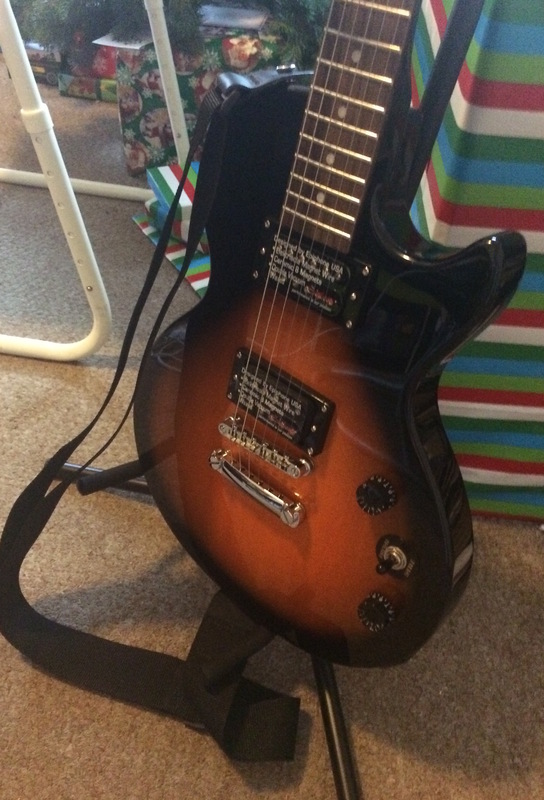 I have an acoustic guitar, but I have always really wanted an electric guitar, ever since high school. I used to look at pictures of guitars and dream. I have been playing, and things are starting to come back. I am taking an Introduction to Guitar class through Berklee College of Music on Coursera. The course officially starts tomorrow. I’m very excited to see what I can learn. If you haven’t tried out any of the free courses on Coursera, you should check them out. I have taken some really interesting ones. I am excited for the new season of Downton Abbey tonight, even thought it’s the last one. Did anyone catch the special episode of Sherlock? I loved it! I really wish they could air the next season soon, but I understand that now that Martin Freeman and Benedict Cumberbatch are big movie stars, it’s hard to schedule filming Sherlock. What a great show, though. This week will likely be a busy one, with the return to work. I am hoping to grab some time in the evenings to read. I definitely want to finish a couple of books I’ve had going on my Kindle for a while. 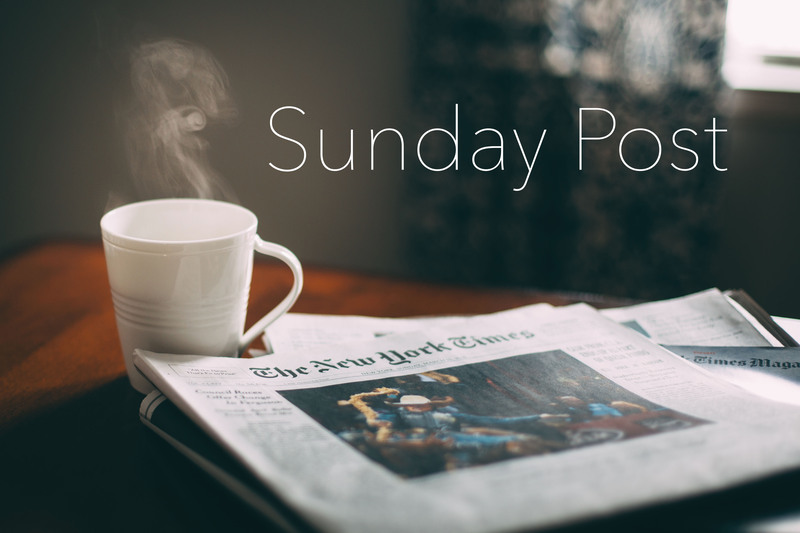 What are you up to this week? What are you reading? Since last week, when I mentioned that we have all the snow, I can tell you we probably have five feet on the ground with more on the way tonight and tomorrow. My children have yet another snow day tomorrow. My own school just called me to let me know I also do not have school; however, I do believe I have a meeting via Google Hangout, and I need to make some soap for a wholesale account, so I imagine I will be busy. We have had record-breaking snowfall the last few weeks. 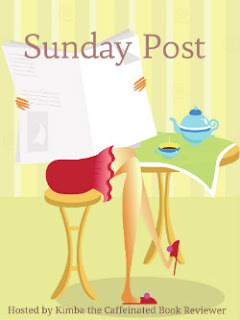 The Sunday Post is starting to sound monotonous with the weather report each time. When you’re more or less snowbound, however, there’s not much else going on. The Tell-Tale Heart, like The Serpent of Venice, is part of a TLC Book Tour. I’m reading As You Like It as my Renaissance selection for the Literary Movement Challenge. Finished Act I as of yesterday. I am listening to Neil Gaiman read the short story collection Trigger Warning. After finishing The Fiery Cross, I didn’t want to dive right into another really long Gabaldon audio book right away. 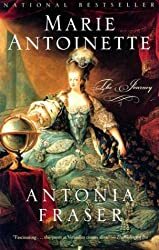 I have had Marie Antoinette: The Journey in my Kindle library for a very long time, but I finally decided to read it after watching the Kirsten Dunst film Marie Antoinette, which reminded me how fascinated I am by the French Revolution and all the history leading up to it. The movie itself, I have to say, was kind of weird. The costumes and sets were gorgeous. The music was strange. Some of the casting was bizarre. The jury’s still out on whether I liked it or not. I searched in vain for a documentary about the French Revolution on Netflix last night, so I decided to start reading the book. Also on my list at some point is Simon Schama’s Citizens: A Chronicle of the French Revolution. I’m always on the lookout for good historical fiction set during this time period as well, so let me know if you know of anything. I have previously read Jennifer Donnelly’s Revolution (loved! ), Michelle Moran’s Madame Tussaud, and Melanie Clegg’s The Secret Diary of a Princess. And of course, Charles Dickens’s A Tale of Two Cities. I can’t recall any others, so let me know what I’ve missed. I am not particularly more interested Ancien Régime versus post-Revolution or nobility versus Estates-General. I’m not picky. I love reading historical fiction, which is one of the reasons I always try to participate in the Historical Fiction Reading Challenge, no matter how active I actually am in the challenge. If I had to peg my favorite periods, I would say 18th and 19th century America (particularly New England, but really, it’s all pretty interesting), the Middle Ages, the Renaissance, 18th century France and England, and 19th century England. I do not much like to read WWII historical fiction, which reminds me of a post of Stefanie’s that I read over at So Many Books: “Books I Won’t Read.” I am not going to go quite so far as to say I will not read books about World War II. I really hesitate, though. I find it mentally exhausting and very depressing to read about that war, for obvious reasons. Inevitably, the books are heart-wrenching. I hate to say it feels like manipulation on the part of authors to write about the events of that war, especially when they really happened, but it’s also quite difficult to criticize. After all, anything you say in critique of books about the Holocaust just makes you sound heartless. So, I’m really careful about what I choose to read from that era. If a book has a whiff of cashing in on that tragedy at all, I can’t read it. So far, I’ve finished seven books this year. I can’t recall ever having read that many at this point in the year. Honestly, I think the goal I set of reading 52 books has been a good motivator for me. I know I’m making more of an effort to read. I think of myself as a slow reader, but it looks like I have managed to pick up speed over time without noticing much. I very rarely can sit and read an entire book all day, and I haven’t tried timing myself to see how fast I’m actually reading. It’s more just a sense I have that I’m able to read books faster than I have in the past. The biggest news in the book world this week is the impending publication of Harper Lee’s second novel, Go Set a Watchman, which will feature an adult Scout Finch. Some speculation in the media has made me wonder if Harper Lee was aware of what her lawyer was doing, but it’s hard to tell. This New York Times story does a fair job discussing the controversy. I am going to read the book. I have actually already selected it for my school summer reading choice. I called dibs the day the announcement was made. I am not going to miss another Harper Lee novel. Am I worried it might not be as good as To Kill a Mockingbird? Of course. It’s natural. But there is no way I’m going to miss it. And while I’m on the subject, I wish Goodreads would stop people from reviewing or rating unreleased books. Or, to be more specific, unreleased books that no one has read yet. I actually find ratings and reviews from folks who had uncorrected proofs or early access through other channels helpful. This book already has a 3.72 rating on Goodreads. Come on.